Apple: iPad Will Beat Netbooks With "Magic"
In a talk intended to woo investors, Apple Chief Operating Officer Tim Cook said the iPad will win over potential netbook buyers, but not because of specs or features. No, Cook said the iPad's magical properties will seal the deal. 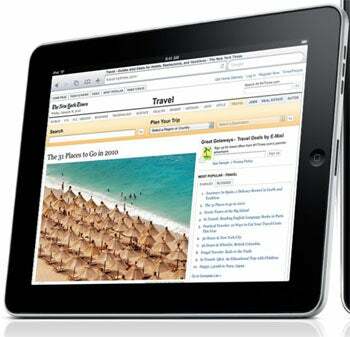 "The netbook is not an experience people are going to continue wanting to have," Cook said, according to Macworld. "When they play with the iPad and experience the magic of using it ... I have a hard time believing they're going to go for a netbook." I'm not trying to be flippant by bringing this up. Cook is, of course, brings up a valid point about the user experience, one that will be similar to the iPhone. On paper, netbooks can do everything the iPad can -- and more -- especially netbooks with graphics accelerators for watching HD video. They're cheaper too, and more customizable, with an operating system people are familiar with. But there is something about that user experience. When Apple introduced the iPhone in 2007, sans App Store, it was a hit -- even though you could get the same basic features of Web, multimedia and e-mail on other phones. When Apple introduced the iPod in 2001, it was a hit even though other MP3 players, such as the Archos Jukebox, let you store more music (side note: step back in time and check out the iPod's foresight-lacking detractors). The difference in all cases is the value Apple puts on user experience. However, the iPad is also in a different situation, because it's not an Apple netbook. While the iPhone succeeded other smartphones, and the iPod succeeded other MP3 players, the iPad is a slim touch screen device that doesn't quite compare with a netbook. That means consumers will have a harder time thinking of it as a device for traditional computing. If Apple wants to take on netbooks, the real challenge will be convincing people that the iPad is not just for entertainment -- an oversized iPod Touch, if you will. With the introduction of iWork for the iPad, the iPad indeed accomplishes the original goal of the netbook, which was to provide a simple device for Web browsing, e-mail, and word processing. But the usefulness of netbooks has expanded, and they're now considered mini-computers. When my old laptop kicked the bucket, I used a netbook for work every day until I scraped together enough cash for another notebook, and it was fine. I'm not sure the same could be said for the iPad. If your work is limited to office productivity software and e-mail, you'll be fine. But can a Web developer write code on the iPad? Can a blogger download, edit and upload photos? And what about specialized software that only work on Macs or PCs? For people whose work requires a bit more flexibility, no amount of magic will get the job done.